Aniek is a soft and friendly typeface family inspired by the handwriting of a former girlfriend. The monolinear contrast and soft endings echo very clearly the characteristics of the strokes of a felt tip pen on paper. 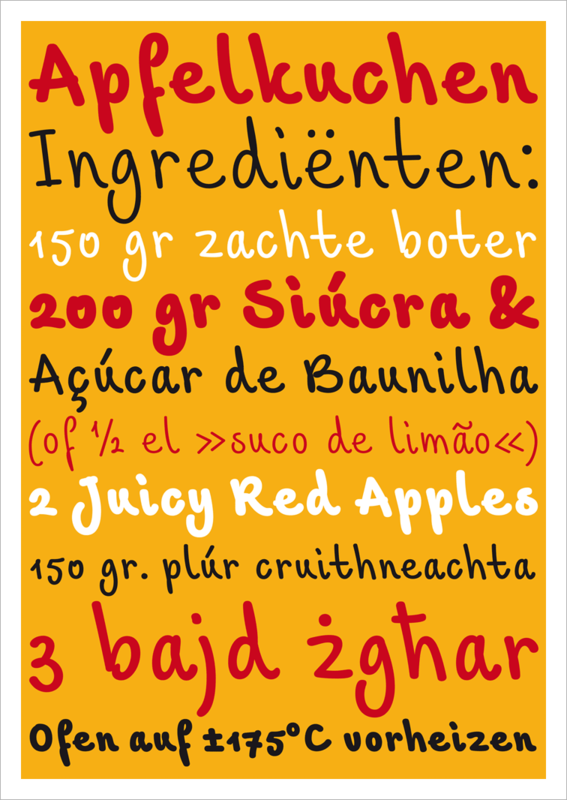 A distinguishing feature of Aniek is that it has a slight slant to the left where most other script typefaces are slanted to the right. Aniek tries to capture the charm of handwriting but tries not to imitate the irregularity and imperfection of the human hand. All letters are non-connected, the proportions are harmonised and the spacing has been made as regular as possible for instance. This assures that Aniek can be used in longer pieces of text and remain surprisingly legible there. Aniek comes in multiple weights and each font has an extensive set of Latin characters that covers the majority of European languages.